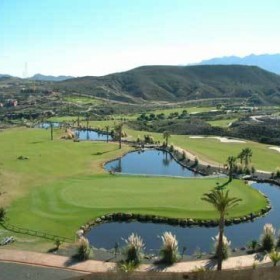 The Valle del Este Resort occupies a 108 hectare site.Wide fairways, elevated tees, receptive greens with a wide range of flag positions, as well as strategically-positioned water hazards and bunkers to make each hole an authentic challenge regardless of your standard of play. Desert surroundings with the occasional view of the Mediterranean, rolling hills and steep cliffs make it visually spectacular. Its small round tee-boxes, as many as six on some holes, provide daunting looking carries. However, because most tee-shots are downhill, they seem much tougher on the eye that on the swing. The fairways wind their way through a landscape that rivals some of Arizona’s best desert style courses. 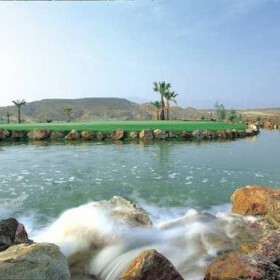 Cacti, large boulders and the occasional water-hazard only punish the severest of misses. The greens, both very fast and true, due to their size, offer a large variety of pin-placements, on some holes up to a 4 club difference. At par 71, the three par 5’s are all reachable with two good hits by tour-pro’s, but when you gamble and miss, you will pay the price. For the beginner, spectacular as they may look, they can be managed without difficulty by 3 or 4 more conservative shots. The par 3’s, two of them uphill, are all completely different. Number 2, a long uphill hole with a large green requires a well struck long iron or fairway wood. Holes 6 and 14 can be reached with a mid-iron, and even a missed shot still leaves an opportunity for an up and down. 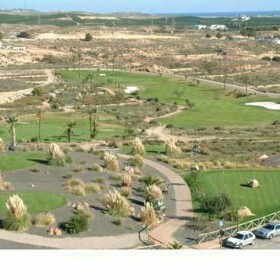 Valle del Este’s signature hole 12 however, does not. Certainly length is not a problem at only 174 yards of the back-tees. The dried riverbed of the river Nuño is. Many a golfer will wish to return to the driving-range before teeing of on this hole to get another 50 practice shots in. Short means reload, long, two small bunkers wait. This hole, simply one of the best par 3’s in Spain. Buggies, Hand and electric trolleys, Driving range, Pitching green, Putting green, Club hire, Golf lessons, Restaurant, Bar.